I painted this subject "Branch in water" in Turkey. I was fascinated by the sun-bleached and sandblasted branch balancing steadily in shallow water. The symbolism in it seemed clear but not blatant. I usually let my paintings hang on the wall to "ripen" for a while before declaring them finished. It took nearly two years before I realised what I needed to do to improve this painting. The rock on the left was actually melted volcanic lava, hence the stripes. Although it adds a dynamic touch to the subject it also distracts the eye. The same thing happens with the turbulent water. 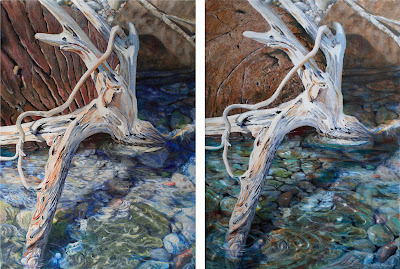 In the repainted picture on the right, both the rock and the calm water become part of the background, instead of competing with the branch for attention as they did in the first painting. Now I have declared the painting finished. Amazing! Subtle changes to the painting, and yet it brings the branch so much more to the forefront.